Carrot. Poppy seed. Brownie. Lavender. Basil. Pistachio. Not my shopping list, just a brief list of the sometimes bizarre, yet always wonderful and delicious ice cream flavours, that I tried over the past month at Puro Gelato. And I’m not an ice cream person, really. Until now I would get maybe one Míša every summer when on the brink of overheating. However, now that Puro Gelato opened its doors, I’ve found my perfect after-lunch dessert. 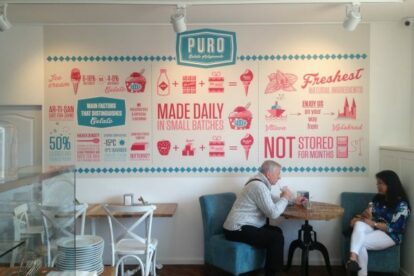 Run by a friendly Slovakian crew, Puro Gelato nailed the perfect location. Just a few steps from the river and next to the popular wine bar Na břehu Rhôny, there’s always plenty of people of people passing by. The interior is cozy, bright and inviting. You’ll also find a fun infographic on the wall describing the difference between ice cream and gelato, which, up until now, I thought was essentially the same thing. If you’re a rookie like me, apparently gelato has a lower fat content, is less cold so it melts faster, has a higher density, and is made in small batches. Everyday the flavours are completely different, depending on what those gelato magicians think up the night before. For the price of one scoop, you can choose two flavours, either in a cone or a cup. I usually go for one milk-based and one fruit-based but, hey, it’s hard to go wrong. Whether you’re on your way to Vyšehrad or to the river I dare you not to go in. Can’t be done.